You know the problem with running after work? I mean besides the fact that I’m tired and less motivated to run. Everyone else is making food and the smell of dinner just wafts onto the streets. And I’ve noticed now that the weather is warming up, lots more people are turning on their barbeques. I love the smoky smell of things grilling and it got me thinking about what I could throw onto my own barbeque. Have you ever watched those ‘Epic Meal Time‘ videos where they’re making those gigantic creations with bacon, ground meat and everything but the kitchen sink? Well, this is a little bit like that but on a much smaller scale. A quick word of warning, you can’t be afraid to get your hands dirty! Got bacon, cheese, hamburger patties and hot dogs? Perfect! Then you’ve got all the ingredients needed to make these little guys. Okay well they’re not exactly “little”. In fact they’re deceptively filling but oh so good! Why choose between a hamburger or hot dog when you can use them all in this recipe. These make a seriously tasty treat, meal, snack? You decide. Enjoy! I highly recommend making these on the BBQ because of the bacon. Make them in your oven and your house WILL smell of bacon for a day or so afterward. Soak about 10-12 toothpicks in water – you don’t want them to burn while your turtles are cooking. Preheat your oven to 375F or turn on your BBQ. 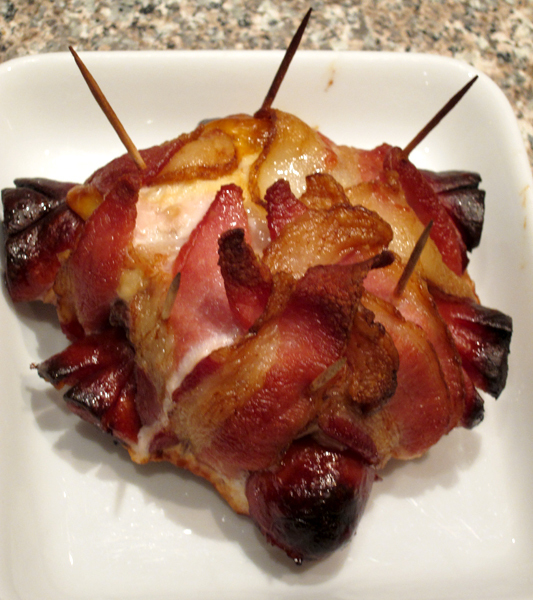 Create a bacon weave using 8 strips of bacon. Lay four strips of bacon in a row and then start weaving the other 4 strips creating a square shape (think of making a basket). You may only need 6 strips depending on the size of your hamburger patties. Remember that bacon stretches. Place your first hamburger patty on top of the bacon weave in the center then layer on a slice of cheese and then place another hamburger patty on top of that. Wrap the bacon weave around the patties. You may need to trim the bacon to fit around the patties. Cut out hog dog pieces to create the head, tail, arms and legs. For the tail, cut the end of a hot dog piece into a triangular shape and for the arm and leg pieces, cut two small slits into the end. Make sure each piece is long enough or it may fall off during the cooking process. 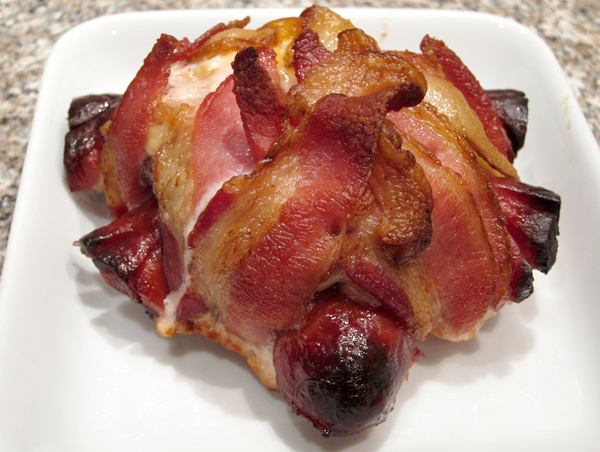 Create holes in the bacon weave and put the hog dog pieces into the body. Secure the pieces to the body using toothpicks. For the oven, place the turtles onto a baking sheet and put into the oven for approximately 40 minutes or until the juices run clear. For the BBQ, brush the bottom of the turtles with a bit of oil to prevent them from sticking to the grill. Check on the turtles after 25-30 minutes to make sure they aren’t burning. You can use an internal thermometer to check for the doneness of the patties. I can’t wait to try these. They’re exactly the type of thing I would love to eat! They are quite good! When you try them, let me know how they turn out. Will do. I’m trying to convince my friend to make them as party meals tomorrow. I think they would appeal to guys. Will do! I’m trying to get a group of friends in to each bring part of the supplies so we can BBQ together! I bet my kids (and husband) would like these. Did you use pork or beef hotdogs? I used pork sausages but I think either beef or pork hotdogs would work well. Let me know how they turn out if you try them! That looks delicious! 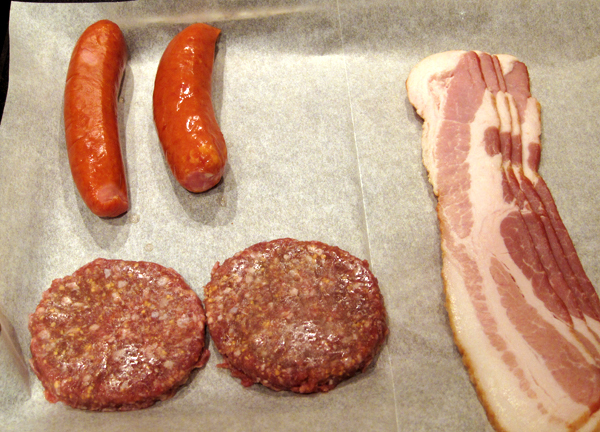 Hamburger, Sausage and bacon, how could you go wrong? Omg, these are so cute. And I bet they are especially amazing on the grill!